The Rocky Pitch trail is located in the Uncompahgre National Forest near Grand Junction, Colorado. Rocky Pitch is a multi-use trail open to most everything except jeeps. Most of its use comes from ATV and dirt bike enthusiasts but it is also a good hiking trail. A loop can be formed by incorporating the Divide Road into the route. To avoid hiking along the road this post makes use of an old trail that is open only to hikers to form a semi loop hike. 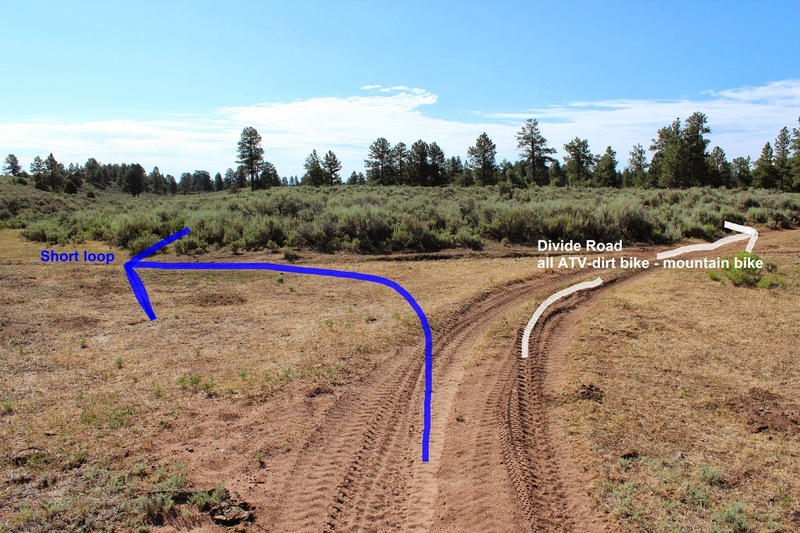 Using the Divide Road is actually 1 tenth of a mile shorter but passing vehicles kick up an awful lot of dust when they pass by. 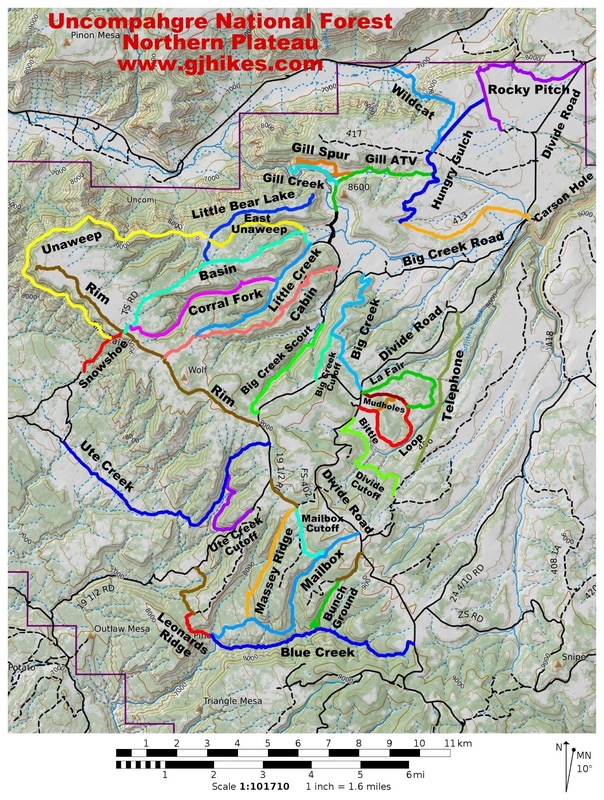 The upper Rocky Pitch trailhead is located right at the Uncompahgre National Forest northern boundary on Divide Road. According to the Google Maps 'Get Directions' function the trailhead is 21.3 miles from Whitewater, Colorado. The last 6.4 miles of the drive from the Divide Forks turnoff on Highway 141 is a graveled road that the county usually keeps well maintained and treated. Once the snow is gone off the road it shouldn't be any trouble for passenger cars. A second trailhead is located on Forest Road 402.1A. That road is short but usually requires a high clearance vehicle. The entire length of the official trail is a nice wide double track. For ATV's the trails is restricted to a width of 50 inches. That eliminates most side-by-side type ATV's. 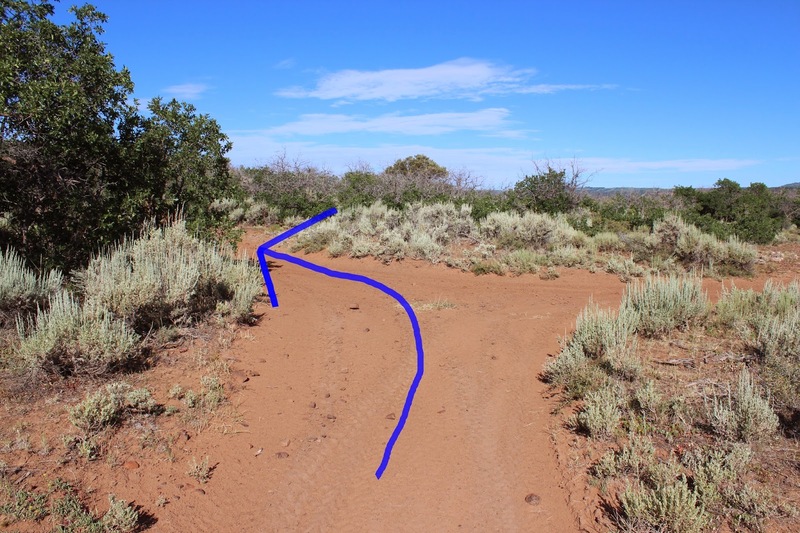 The trail makes a slow sweep from the trailhead initially heading south and then gradually curving toward the west and then more to the north. After a little over 1 mile the trail begins descending into a drainage where there is a grove of aspen trees. The grove of aspen trees is where we begin our hiking loop. 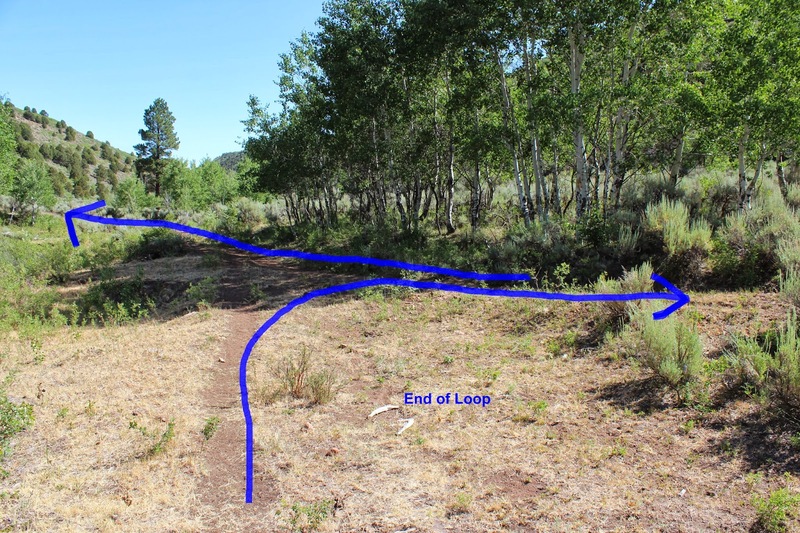 As the trail climbs out of the drainage stay to the left to avoid entering private property. There is a lot of climbing at this point up a steep rocky slope. Maybe this is where the trail gets its name. Be prepared to see deer and elk secluded in the oak brush along the trail. Actually, deer and elk may be spotted almost anywhere on the entire length of the trail or the nearby slopes and meadows. They are normally very plentiful in the Uncompahgre National Forest as a whole. At the top of the ridge you are rewarded with views of Unaweep Canyon and the south side of Pinon Mesa to the north. As the trail continues heading west along the ridge it is following the northern Forest Service boundary. One of the best kept secrets for out of the way picnic spots is right on the ridge at the point where the trail makes a 90 degree turn to the south. The rugged cliff makes a precipitous drop at this point. From the picnic area the trail turns to the south. At this point we are about 2.7 miles into the hike. The trail continues south in a straight line along a fence. 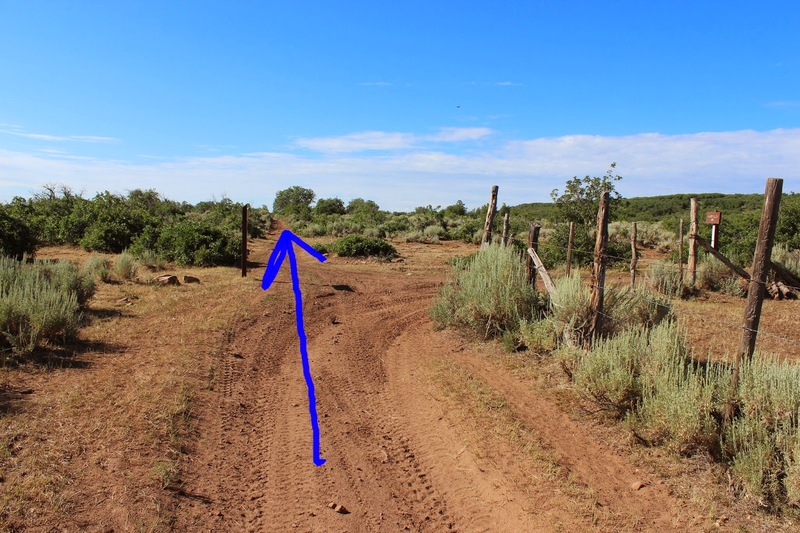 The fence makes a 90 degree turn to the west after about a half mile where there is a trail sign for the Hungry Gulch trail that departs in that direction. The Rocky Pitch trail keeps going, still following a bee line southward. At 3.8 miles the trail finally begins breaking slowly to the east and after 4 miles it comes to another junction. It is at this point that we take advantage of our privileged status as hikers and follow a different trail to avoid having to hike along Divide Road. Anything with wheels is going to have to stay to the right or turn around and return the way they came. From here it is only a tenth of a mile to the trailhead on FR 402.1A. We hiked over to it so that we could mark its spot on the map. If you forgo doing that you can subtract 2 tenths of a mile from the expected round trip distance. From this point back to the aspen grove the trail is a single track that disappears while crossing a few sections of slickrock. 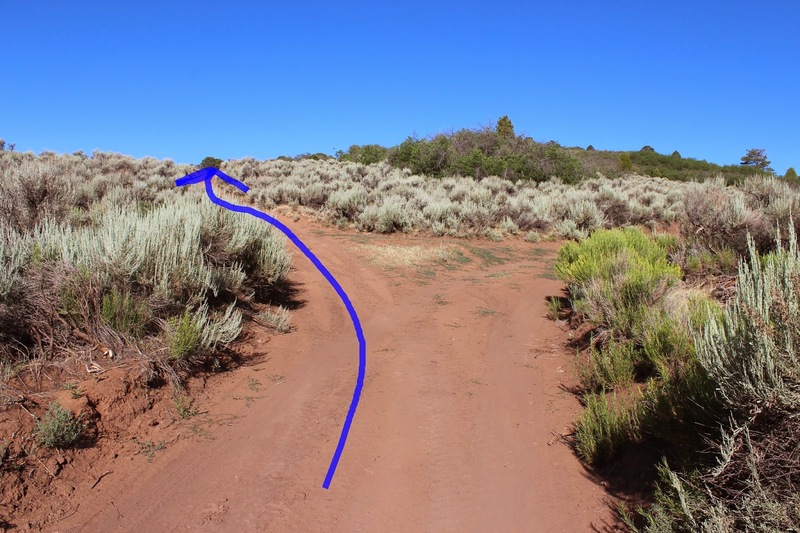 In a few other places cattle and big game trails add a few confusing options to the route finding. The important thing to remember is to pick the trail that is heading toward the aspen grove. Fallen trees make parts of the trail through the aspen lined drainage a little challenging in a few places but as long as you stick to the bottom area you can't miss hitting the main trail again. And that is where we find ourselves after about 5.6 miles of hiking give or take a couple of tenths depending on earlier choices. From here it is all a matter of retracing steps back to the trailhead. 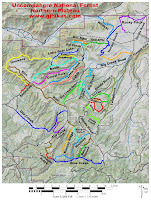 The Rocky Pitch trail is the first one that you come to when you enter the Uncompahgre National Forest from the north. That may have something to do with its popularity although we didn't come upon anyone else on this trip and there were no vehicles in the parking area during the time we were there. If you would like to see it for yourself then all you have to do is 'Take a hike'.